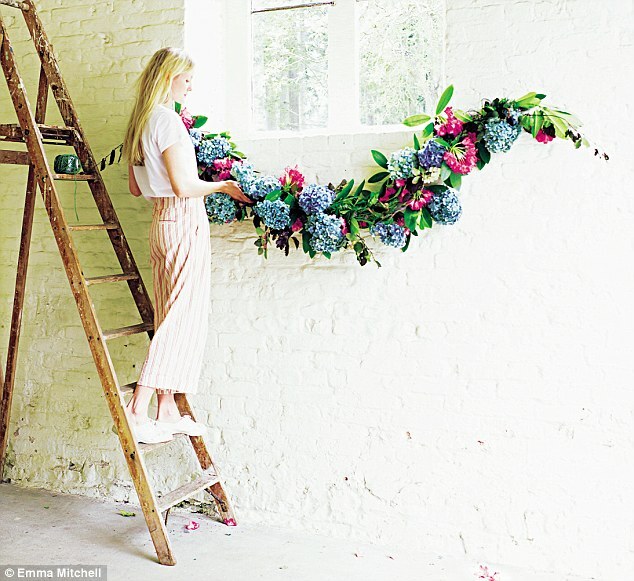 Hydrangeas are big, beautiful and perfect for creating dramatic garlands. This one can be made with fresh or dried blooms. 1 Measure how long you want the garland to be with some ribbon or string, and add an extra 20cm on each end for hanging loops. Arrange the beech and oak leaves along the ribbon or string. 2 Hold the florist’s wire tightly and, starting at one end, carefully wrap it up and around the foliage and ribbon or string to bind them together. Secure the wire at the other end. 3 Feed in the hydrangeas, rhododendrons and rosemary along the garland wherever you want them. Depending on where the finished piece is to be displayed, it may be easier to add the flowers when the garland is in situ. This way, it’s less likely to come adrift when you carry it into position. 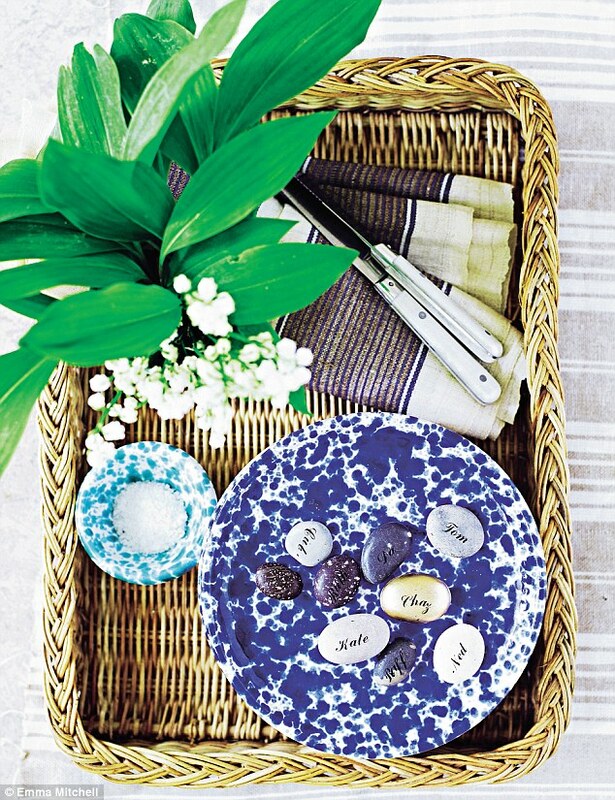 Small, perfectly formed pebbles, smoothed and buffed by the sea, make original name places on a party table. 1 If you wish, coat some of the pebbles with gold-leaf paint and leave to dry. 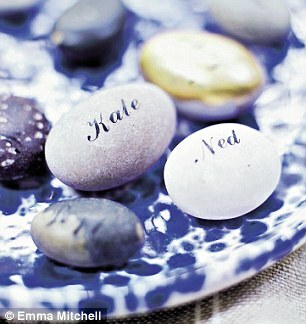 2 Take each pebble and, using a coin, rub on the letters to spell out your guests’ names. You won’t believe how simple these are to make – but your guests will think that you’ve spent hours doing elaborate things with tweezers and tiny petals. 1 Bring some filtered water to the boil and leave it to cool – this stops bubbles from forming and keeps the ice clear. 2 Pour the cooled water into the ice-cube tray, filling each square by a third, then place in the freezer and leave to freeze. 3 Select the petals you want to use. 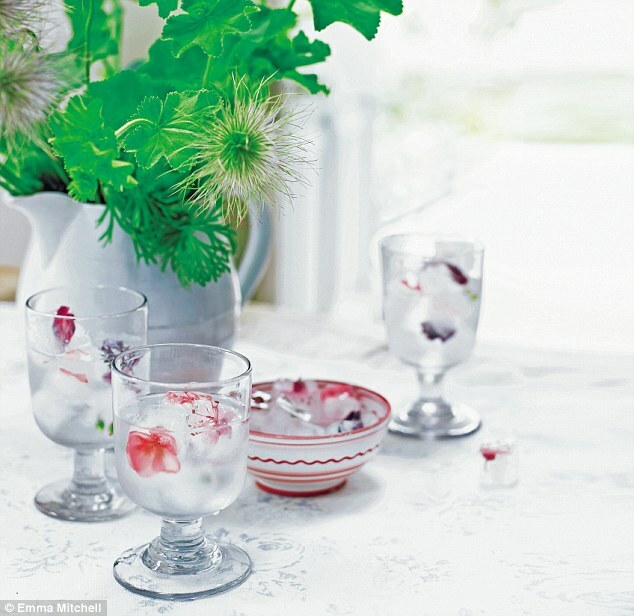 4 Remove the ice-cube tray from the freezer and lay the petals on top of the ice cubes. Top with water and return to the freezer until the cubes are completely frozen. Make your own napkin rings with bright and beautiful slices of agate and quartz. 1 Place the newspaper on a work surface. 2 Arrange the slices of agate presentation-side- down on the newspaper. 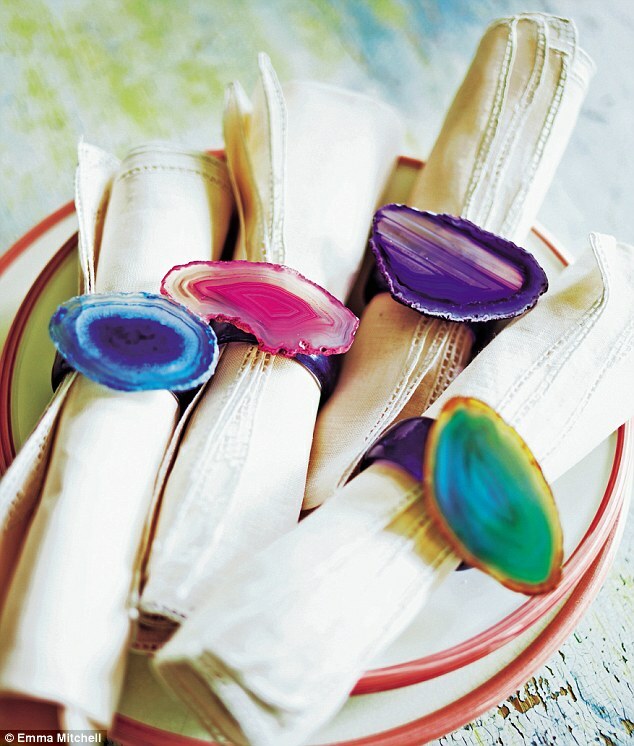 3 Apply blobs of glue to the napkin rings and stick them to the agate slices. Leave to dry for 24 hours. It has a short lifespan, but nothing says spring like blossom. 1 Cut the apples in half horizontally so that you reveal the star-shaped cores. 2 Put all the apples in a bowl of cold water and squeeze in the juice of the lemon – this will help prevent them browning. Soak for 10 minutes. 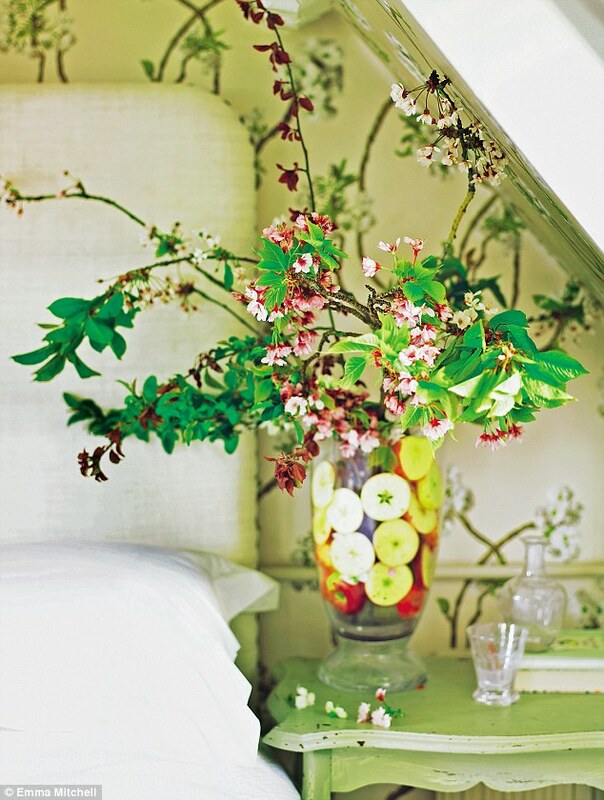 3 Meanwhile, arrange the blossom in the small vase and fill it with water. 4 Place the vase that contains the blossom inside the larger vase. 5 Cut the apples into 2cm slices, then slot them into the gap between the two vases. The apples will look good for a few hours, making this perfect for a party. Once they are too brown for your liking, simply lift the vase of blossom out and enjoy it on its own, apple free. 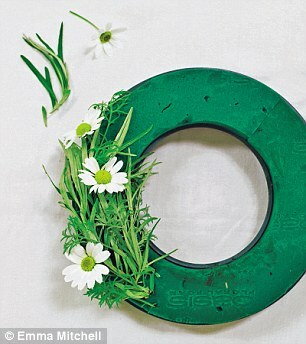 This grown-up take on a daisy chain makes a cute wall decoration. 1 Soak the florist’s foam according to the instructions, then let it drain for a few minutes so that it’s not too saturated and dripping all over the place. 2 Cut the buckthorn and rosemary sprigs at an angle with the secateurs so they can be fed easily into the foam. 3 Cut a length, about 50cm, of green string and tie it around the top of the wreath to make a hanging loop. 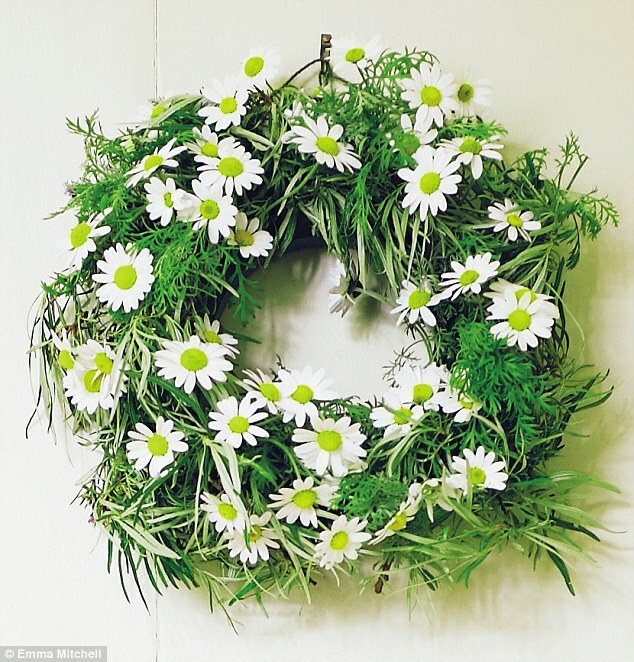 4 Working on a flat surface, lay out the foliage and fill the wreath on the front and sides with sprigs of greenery. 5 When you have an even covering of foliage, start filling in with the daisies. For a natural look, vary their lengths. Snip off or tuck in any wayward trailing stems when the wreath is hanging. Assembling a ‘scientific’ display with grouped single stems creates impact. 1 Cut the stems on the diagonal with secateurs. 2 Plunge the ends into 6cm of boiling water for about ten seconds, to prolong their life. 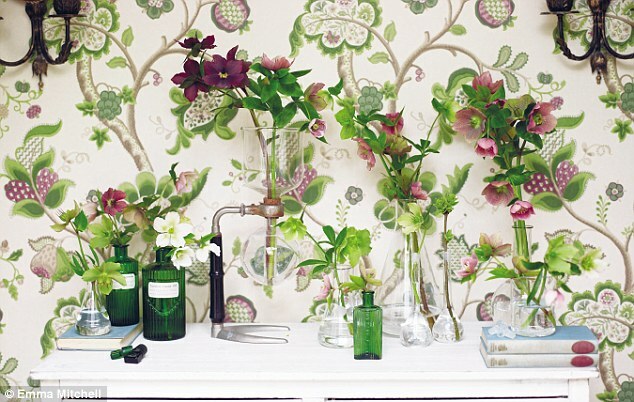 3 Put the hellebores into containers with cold water, removing any leaves that would be under water. 4 Keep in a cool room and change the water every couple of days. 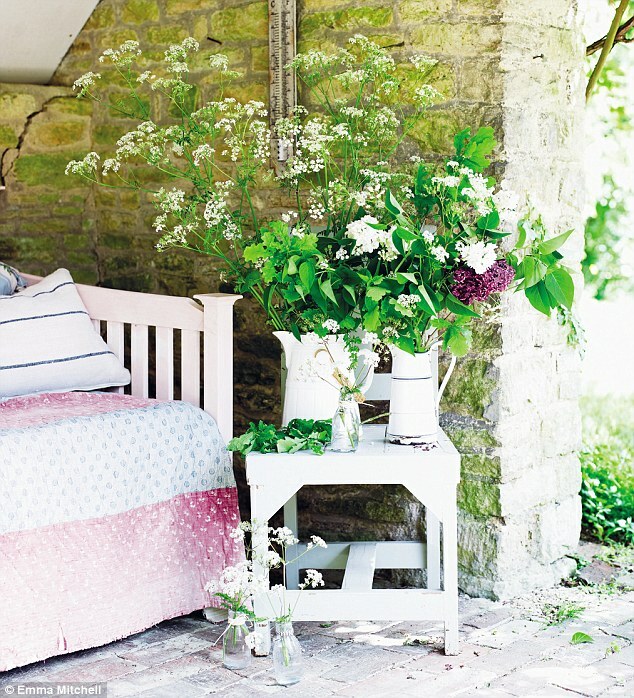 A huge bunch of Queen Anne’s lace will look ravishing on its own in a vase but it is just as beautiful paired with lilac, as shown here, which flowers at the same time. Late-flowering white narcissi, tulips and alliums also make beautiful companions. Meanwhile, old glass vases filled with shorter individual stems highlight their frothy, relaxed nature to perfection. TIP If you dip the stems in boiling water, then plunge them into cold water up to their necks for 10 minutes, Queen Anne’s lace can last a surprisingly long time. This is an edited extract from Inspire: The Art of Living With Nature by Willow Crossley. Inspire is available now at Anthropologie, click here to buy.